Picture this…Sheila had just got a brand new job and was excited. The days leading up to her first day she made sure that she had the clothes she wanted to wear, she knew where she was going and she’d even played through scenarios in her head on how to make the best impression and what she’d be able to offer. And after a very brief scoot round the office where she was introduced to other people and shown the facilities and the fire exits she was given the staff handbook and asked to read through it. Needless to say, this wasn’t the best start to a company and new job that she’d ever experienced and no prizes for guessing that she didn’t stay there long. Saying that, there’s nothing more frustrating than going through the process of recruiting someone for your team only for them to jump ship soon after they’ve started. But, although you can’t guarantee that this will never happen to you, there’s a lot you can do to prevent it. This is probably the most crucial thing you can do. Imagine being invited to a friend’s house for dinner and when you turn up it looks like they weren’t expecting you. This is exactly the same deal. Make welcoming your new starter your main task for that week and be available for them. No rushing off into meetings, or out of the office. 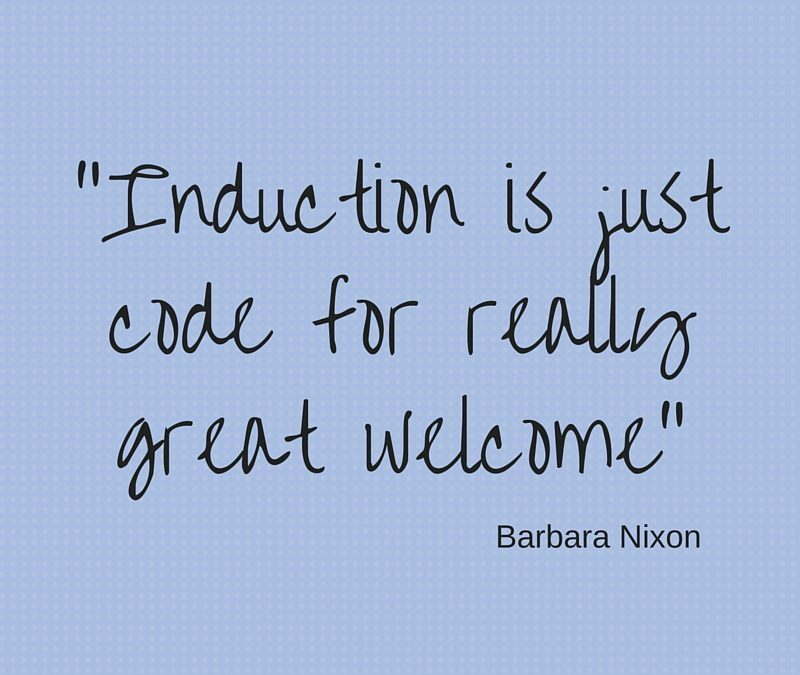 Instead prioritise their induction as the most important thing you’ve got to do. Make sure they have everything they need all set up and ready for when they walk through the door. Their desk, chair, stationery, computer ID, phone…you name it. Create a time-table of events for the first 4-6 weeks so that everyone knows (especially your new starter) what they’ll be doing during that time. Make sure you build in plenty of time for catch ups so that you can see how they’re getting on, and to answer any questions they may have. It might be tempting – especially if you’re really short staffed – to get them to jump in and get busy. Now, this does depend on the role and the company, but remember they only get one chance to be new so don’t rush them to get busy too quickly. Although you may have gone through the background of the company at the recruitment phase, it’s always a good idea to do it again. Talk about what you do in detail. Give them the opportunity to spend time with different people and different departments to see what happens and talk about your values and culture so they can see exactly what it’s like to work there and how they fit into the jigsaw puzzle. They may have come from a company where they knew everyone, had friends and fit in. Now all of a sudden they might miss that, and the ‘small’ thing of having someone to go to lunch, or coffee with suddenly feels huge. Having a buddy during their first few days is a great way to get over this hurdle. It provides them an ‘in’ to the team and stops loneliness from setting in. Putting in the time to really welcome your new starter is something that will always pay off. By showing them that they’re not only welcome, but wanted and needed, is a great feeling to have and it’ll won’t be long before they soon feel like they’re part of the team. Want to boost your development this year? Subscribe below and you’ll be put on the invite list for my free monthly webinars where we go into detail about topics that matter most to you.